Imagine if you could find the imaging experts at numerous hospitals all in one organized, consolidated directory. You can with Bookyourdata.com! 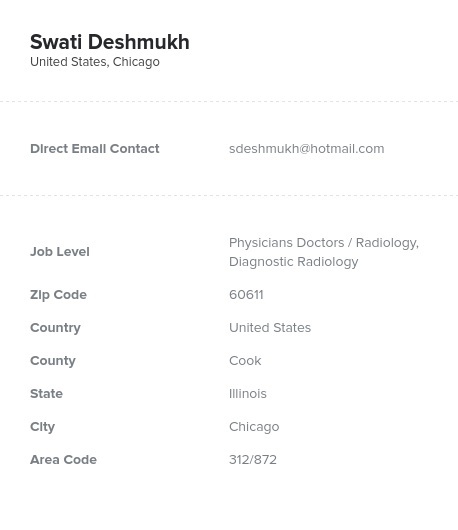 Pull a complete email database of radiologists and diagnostic radiologists that includes phone numbers and other vital contact information. You don't need X-rays to see what your medical marketing efforts need: an organized and accurate leads list of the doctors who would be most interested in your products. With this directory of radiologists and diagnostic radiologists from Bookyourdata.com, you can find key contact information of those in the industry. This normally spread-out group is organized here in an easy-to-integrate and easy-to-use data file. It's ready for you to buy and download right away. Use this mailing list to market your radiology and diagnostic medical equipment, such as X-ray machines, CT scanners, MRI equipment, and other relevant products. Radiologists aim to create an accurate picture of areas of the body to help diagnose or monitor a medical problem. They are often the first to find tumors, broken bones and joints, and other issues that the initial doctor may or may not have been originally aware of. The "photographers" of the medical world, radiologists often work in a network with other physicians to find issues. Radiologists take accurate pictures of patients and this radiologist email list is an accurate picture of those working in the field. Find direct contact information of actionable medical sales leads and start conducting a better B2B marketing campaign to promote your medical imaging equipment or your business as a whole. Buy this list, email leads, and build stronger connections within the radiology field today!